We know that babies, as small and sweet as they may be, can create enormous mounds of washing. So we have developed a special washing detergent that is mild, but at the same time washes uncompromisingly clean. 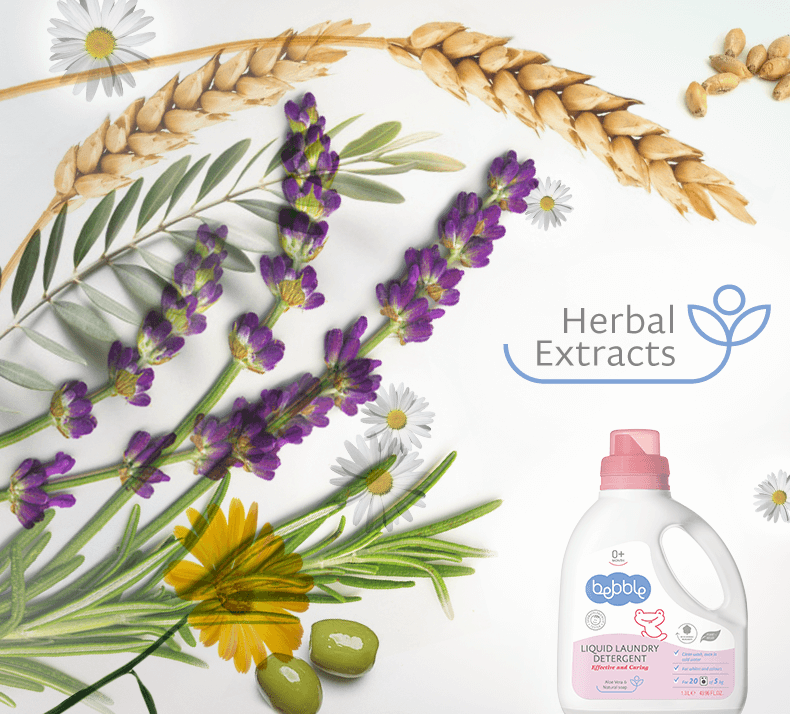 With added natural soap, your baby’s clothes will come out brilliantly clean, even at 30°C. This gentle formula’s active ingredients are 100% biodegradable. It is completely water-soluble and rinses perfectly clean, leaving no traces in your washing. The added herbal extract works anti-inflammatory and calming. 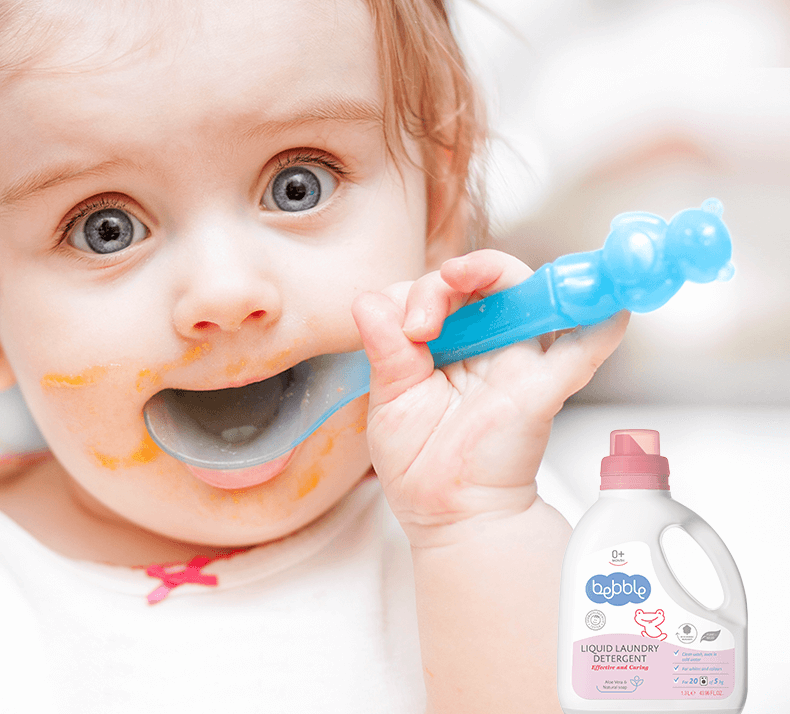 Bebble cares, both for your baby’s delicate skin, and for clean and soft laundry. This liquid laundry detergent is suitable for both whites and colours. Dark or bright items may bleed colour and stain other clothes. Therefore, always sort your washing and wash clothes with similar colours, to keep whites white and colours vivid. During the first months we recommend that you wash your baby’s clothes and linens separately from your other laundry. That way you minimise chances of transferring perfumes, dyes and other chemicals onto your baby’s washing. This liquid laundry detergent is a concentrated formula, so please follow the dosing instructions as indicated on the bottle. 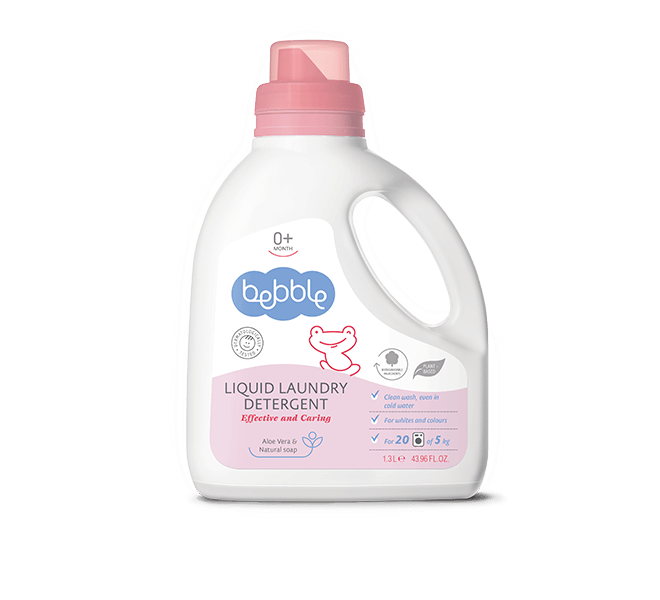 Enjoy your little bundle of joy, and let Bebble do the washing! Vegetable oils are used to produce natural soap, in a process called ‘saponification’. This traditional technique, that was known even to our grandmothers, has survived to this day and is part of the production process of Bebble liquid laundry detergent. Aloe Vera is widely known to work quickly and effectively in treating burns, safeguard the skin from infections and protect it from soreness and irritation. It is sometimes referred to as “the plant of life” because of its healing qualities. It stimulates cell development, improves the skin’s function, and is essential in healing wounds.